Yes… that is right, Easter has barely gone and “already” we are making Three Wise Men! Well and a king and a queen and a princess… I think Easter and the Easter story brought Christmas back to front of mind and Red Ted asked if we could make some King. 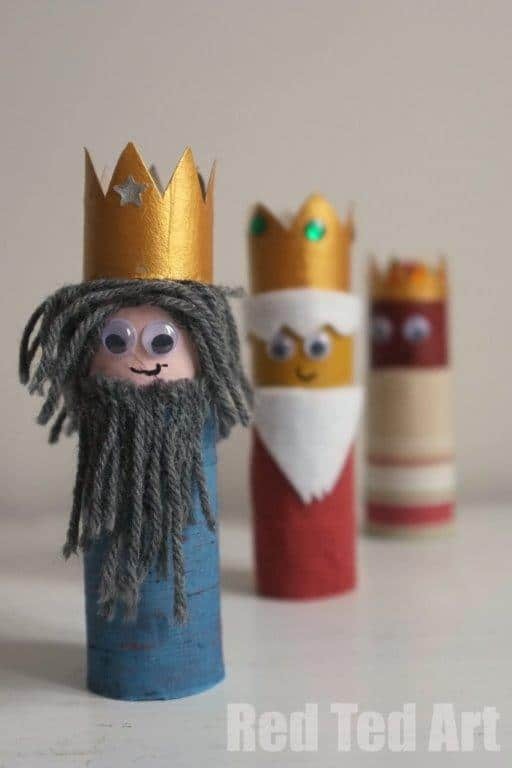 I am not sure of his train of thought, but he saw some Loo Rolls, wanted to make men and then ended up at the Three Wise Men. Pip Squeak of course wanted a princess. So kings, queens and princesses we made! 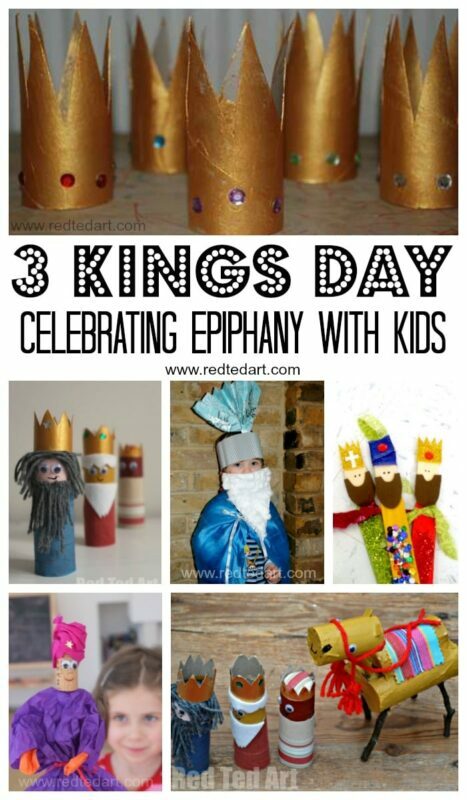 We have more wonderful Three Kings Day Crafts for you to check out! 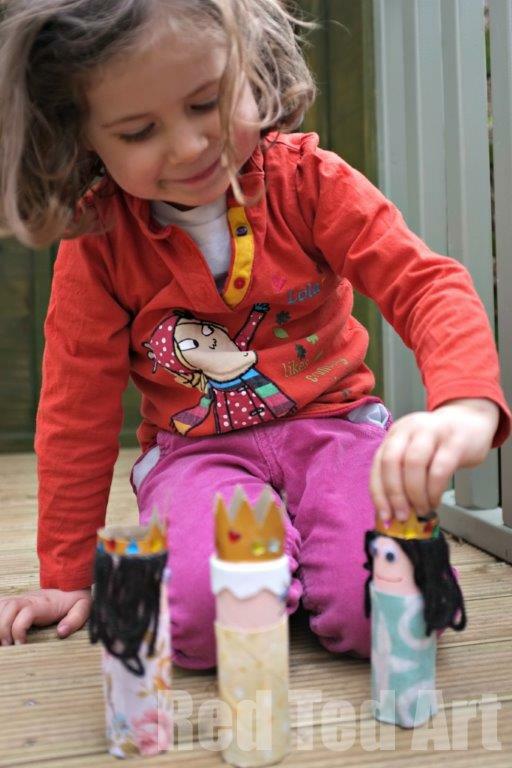 1) The kids painted – we painted various “king face colours” and some queens. 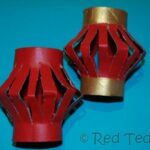 We also painted 2 loo rolls all golden to later cut down to crowns. 2) Whilst the loo rolls were drying, we went to our fabric stash to look for suitable clothes. Red Ted decided he wanted to model his three kings on the three kings from our Nativity playmobil set. 3) Glue on your clothes. 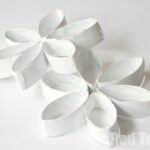 4) Create the hair – we cut strands of wool, and draped it over the loo roll with lots of glue. One of the wise men has a beard and white made from felt and one is bald! 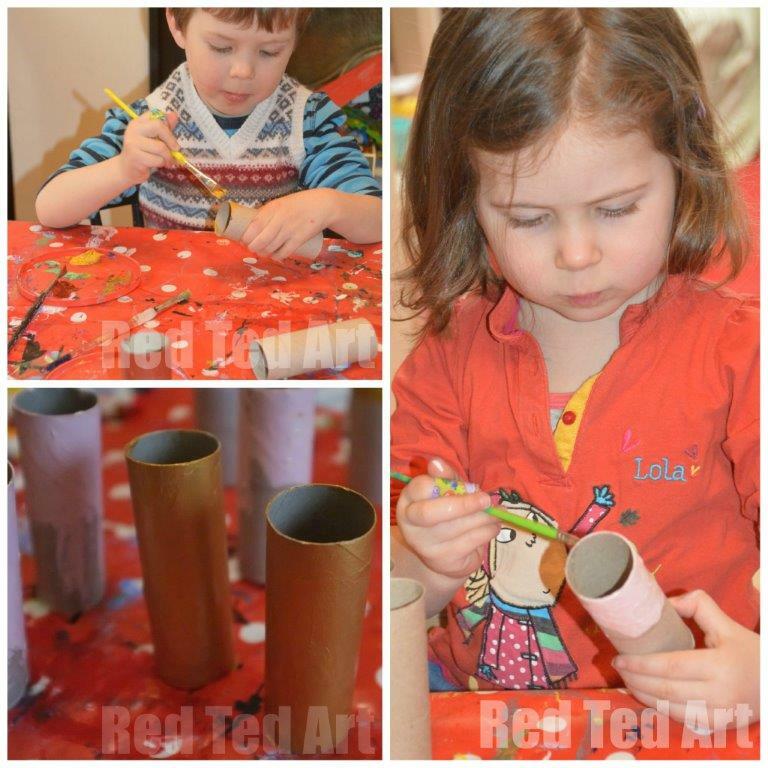 5) Finally, we cute the crowns out of the golden loo rolls and glue them on. Once it was all dry the kids added stick gems. Red Ted stuck to the same colour gem all the way round, whilst Pip Squeak opted for “more is more” and used all the colours and shapes possible. I think I am going to get in trouble with this post in April, right?!?! But there are some Kings an Queens too…. Oh they are really cute. My favourite is still the sad giraffe my kids made – it was such a great team effort. Hahaha yes, we could have a BIG TP people party! 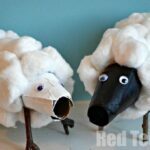 Toilet roll people are truly ace! 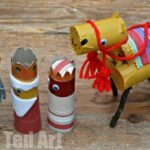 Although slightly disturbed by the Christmas theme 😉 We’ve not made any TP things this year so thanks for the inspiration for this weekends crafty stuff…think we’ll try some animals.. These are so cute! The royal party should have guys and gals. Love these! My little boy loves to pretend to be a king, so we might try them soon! And thanks for letting us link up! 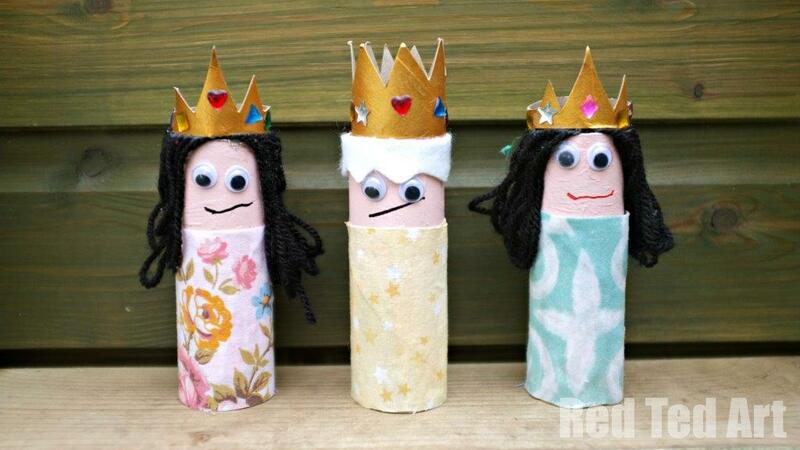 Hooray, so pleased you guys like the kings… I admit, I was a little “nervous” posting 3 Kings in April!!! But the Queens make up for it, I guess!! When I was a teacher (in a Jewish school) we would make kings and queens and other characters in the Purim story. 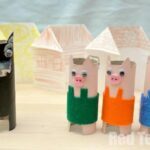 We would use all kinds of containers that the kids got to choose for their bodies, then they chose some kind of paper to cover it and then they chose from the various materials displayed to make their own characters. Lovely Maggy, I must start saving toilet rolls again! 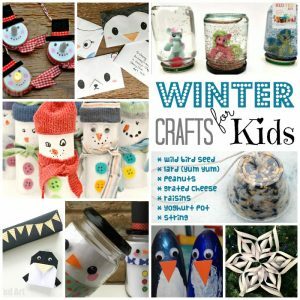 As usual, super fun and super cute craft! Love everything on your site! These are so cute. 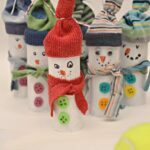 I love toilet paper tube crafts! Ooh thank you Pauline! Much appreciated! 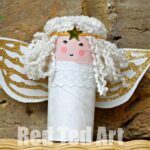 my daughter & i are currently making our own christmas nativity scene with tp rolls? 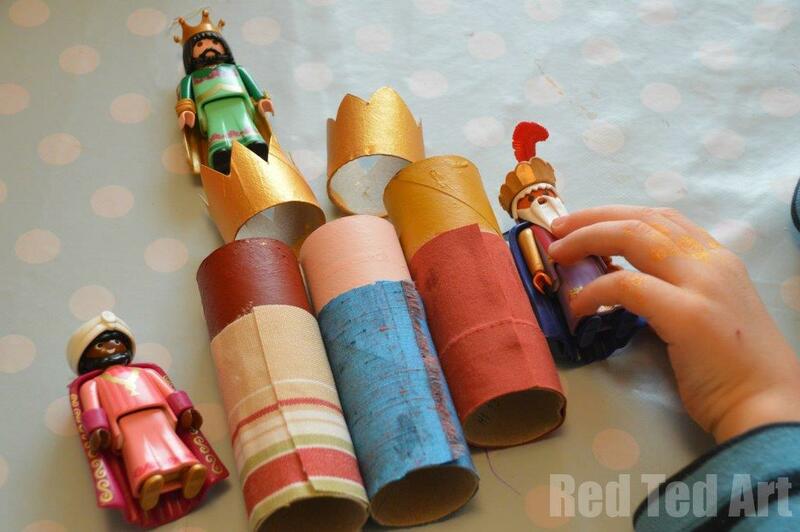 we used ur three kings & ur camel as our inspiration….thanks for all the great content! so far we have completed only the camel….it turned out super cute! wish i could send u a pic of our camel. thanks again!?? Ooooh would love to see it! 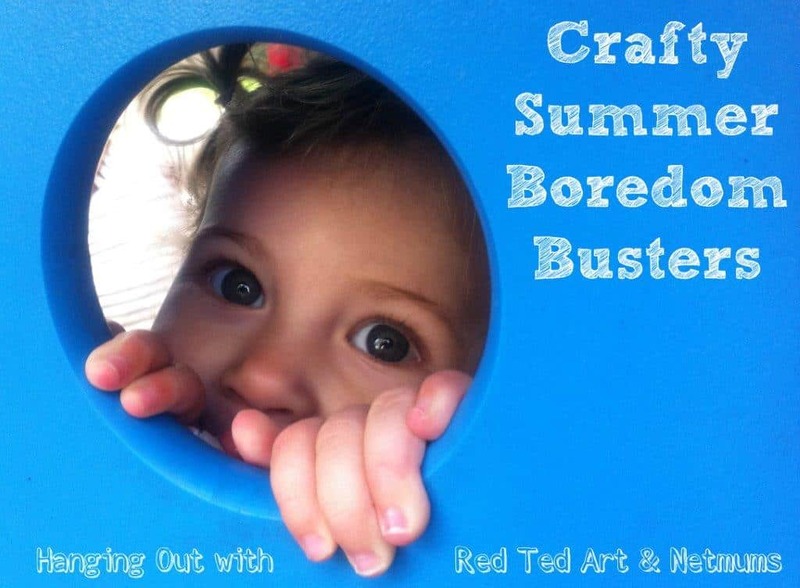 Do send it to info at redtedart dot com!